The Elections Canvassing Commission is set to meet Tuesday. Sen. Bill Nelson is saying he should recuse himself from it. Gov. Rick Scott's claims of "rampant fraud" in Florida's midterm election has been criticized by Democrats, elections supervisors and constitutional scholars. But his rhetoric has also placed him in an awkward spot. Next week, he could be facing a choice of whether to certify the election results. If the election — and the recounts — is truly fraudulent, as he asserts, how could he possibly certify it? 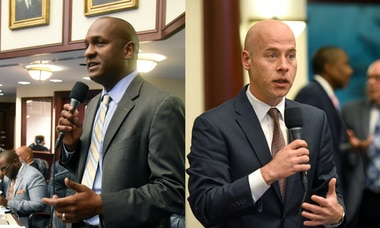 The decision is scheduled to be made on Tuesday, during a meeting of the Florida Elections Canvassing Commission, an obscure board that meets a few times a year to certify the results of each federal, state and multi-county election. The commission consists of Scott and two Cabinet members he picks. In normal years, the commission's work is brief and unceremonious. But this year, Scott faces a conflict of interest. He's in the Florida U.S. Senate race that he would (or wouldn't) certify, and his his opponent, incumbent Democratic senator Bill Nelson, says Scott should recuse himself. 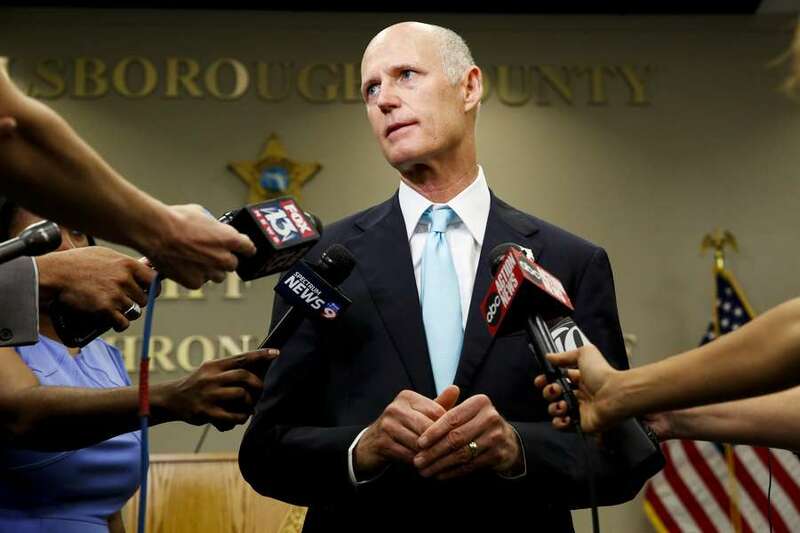 The League of Women Voters of Florida has filed a federal lawsuit requiring Scott to do just that. The case has a hearing before U.S. District Judge Mark Walker on Wednesday morning. "We don't think that he should be his own judge," said Lisa Hall, secretary for the League of Women Voters of Florida. "He should not be determining the outcome of his own election." Scott is clinging to a narrow lead over Nelson, who hopes an expected manual recount will put him over the top. On Tuesday, Scott's office could not say whether the governor would step down, or even which members of the Cabinet he will appoint. And one of his senior advisors, when pressed on national television, has avoided answering the question. There is precedent for Scott stepping down. He did it four years ago, when he and the three other members of the Cabinet were on the ballot. He appointed then-state Senate President Don Gaetz, Sen. Rob Bradley and Sen. Kelli Stargel to fill in for them. Perhaps the most memorable canvassing commission controversy came in 2000, however, when Florida's flawed elections and subsequent recount left the nation wondering who would be president. Then-Gov. Jeb Bush stepped down to avoid conflicts over his brother, George W. Bush, being on the ballot. In his place, Jeb Bush appointed then-Agriculture Commissioner Bob Crawford, a Democrat who had endorsed both Bushes in 1998 and 2000. "It was about four or five weeks of almost pure hell for me," Crawford recalled Tuesday. "I had death threats that still lingered on for a while." Crawford said that the job is essentially ceremonial. Meetings of the commission last barely five minutes, with the three members sitting around signing papers including the vote totals for each federal, state and multi-county race. Because the board doesn't set policy, Crawford said there's no downside for the governor to recuse himself. "If it was me, I would recuse myself," Crawford said. "At this point, if he recuses himself, he has nothing to worry about. By staying on there, it does raise the specter of a conflict." The situation is especially awkward for Scott, who watched his lead in the Senate race dwindle since election night as elections supervisors in Broward and Palm Beach counties continued to count ballots. Scott attributed the dwindling lead to "unethical liberals" who were committing "fraud," an allegation that's been repeated by President Donald Trump, U.S. Sen. Marco Rubio and other top Republicans. There is no evidence of voter fraud, according to Florida's Secretary of State, the Palm Beach County State Attorney and a Broward County judge, who on Monday encouraged both sides to "ramp down the rhetoric." Crawford said he can understand why the governor is upset, considering the incompetence that's happened so far. But by the time the results are certified, Crawford said any doubts about the results should be dispelled. "That would be awkward if, in the final analysis, the governor still had the position there's fraud," Crawford said. "There's hundreds of people working on this and lawyers everywhere. You're not going to have any fraud." -Times research Caryn Baird and The Associated Press contributed to this report.